The beauty and power of crystals and other stones have long been recognized, from the ancient times of Tutankhamen to the modern masterpieces of Cartier and Faberge. Healers, shamans, priests and spiritual seekers have used crystals for their special powers. Crystal healing today continues to find new ways in which minerals can help us restore to balance our stressful lives. Science has yet to determine what happens during crystal healing, but changes felt by the participants and the lasting benefits that can be gained are not diminished by this. A popular theory is that crystals actually vibrate at the same pitch as people, and can be used to relieve suffering because the resonance between the patient and the stone either combats the vibration of illness or amplifies those of health. Traditional remedies, such as herbalism, homeopathy and crystal therapies, can be seen as natural alternatives for, or complementary with modern drugs. With the recent swing toward holistic and alternative medicine, many people are turning to crystals not only to help cure their ailments, but significantly, to maintain optimum health. You can start with a very straightforward collection of stones. Small tumbled stones are very useful in crystal healing. For convenience, select stones that will not be too heavy when placed on the body but won’t be so small as to get lost easily. Flatter stones will stay in place more easily than round ones. Aim to gather at least two crystal stones of each spectrum colour (they don’t have to be the same type of stone). • Small natural crystals of clear quartz are invaluable. It is useful to have 10-12, each about 2-3cm 3/4-l 1/4 inch in length. • Small natural crystals of amethyst, smoky quartz and citrine are less common but well worth acquiring where possible. •A small hand-sized Crystal cluster of clear quartz or amethyst is useful for cleaning and charging your stones and crystal jewelry. 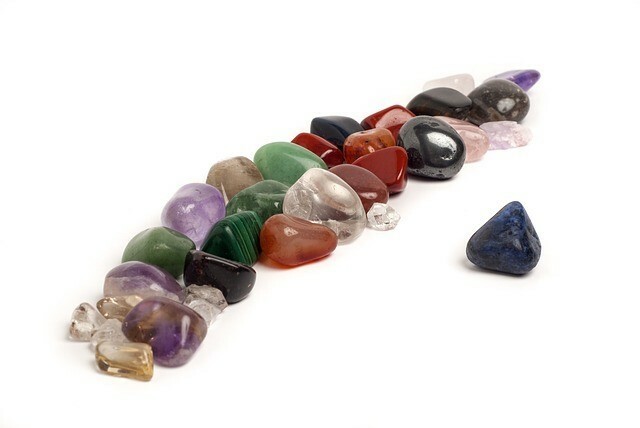 •Larger single stones and tumbled stones are useful to hold and to use as meditation tools. Work with one or two that attract you and that you feel happy with. It is better to work with a few stones, than superficially with many. Whether a crystal is clear or battered and grubby it will have the same internal orderliness and potential for healing. Some crystals are hard, others scratch very easily. Even hard crystals may be brittle and handle them with care. New stones need to be cleansed before you use them. Cleansing crystals removes unwanted energy and restores them to their original clarity, so it should be carried out each time your crystals are used for healing. If you do not cleanse your stones they will become less effective and may pass on imbalances or energetic static. You might detect this as a feeling of heaviness or unpleasantness. INCENSE OR SMUDGE STICK: Hold the crystal within the smoke of the incense or smudge stick. Herbs such as sage, cedar, sandalwood and frankincense are used for their purifying qualities. Placing stones on a crystal cluster will clean them ; alternatively surround the stone with clear quartz points for 24 hours. VISUALIZATION: Take a deep breath and blow over the crystal. Imagine that you are clearing away negativities. Repeat. SEA SALT: Use dry sea salt in a small container and bury the crystal for 24 hours. Don’t use salt water as this damages softer stones. SUN AND WATER: Hold the crystals under running water for a minute and then place in the sun to dry. SOUND: The vibrations of a pure sound can energetically clean a crystal. A bell, gong or tuning fork can be used for this purpose. There are many thousands of minerals on earth, but only relatively few are used in crystal healing. The easiest way to remember what each crystal does is learning the properties of color which will help you identify the general functions of a crystal or gemstone. The color energy of crystals has enormous potential for healing. Learn more about color healing. The Color red stimulates, activates and energizes. It is associated with the first chakra at the base of the spine, which is the centre in the subtle anatomy for action and activity. Ability to use practical skills, movement, motivation, protection, physical survival and the use of life—energy are some of its main functions. GARNET, in its red varieties, is one of the speediest energizers. It will increase energy wherever it is placed. It will also tend to activate other stones placed nearby. RUBY is a red variety of the very hard mineral, corundum. It works with the energies of the heart centre and the circulation within the subtle anatomies. It is energizing but balancing in its effects. JASPER, a dark or brick red massive form or quartz, is commonly found on beaches. It is a useful stone to place near the base chakra. It is grounding and gently activating to the functions of the body. Pink, a blend of both red and white, has a gentle and subtle way of pushing things towards a resolution. It is related to the actions of the base Chakra and the heart chakra, and helps to bring emotions and sensitivity into our daily actions. ROSE QUARTZ CRYSTAL is the best known and favourite of the pink stones. It has a calming and reassuring effect. However, it can also be a powerful releaser of unexpressed emotions where they might be thwarting personal growth. RHODONITE, when polished, is a salmon pink often flecked with black. This works with the practical aspects of our feelings, and has a greater grounding effect than other pink stones. KUNZITE is a pale pink and violet stone. Having striated crystal structure it is an excellent shifter of emotional debris, and also helps self- expression. RHODOCROSITE is a delicate banded stone of pink, yellow and orange. It will help to improve self—image and self-worth, especially when problems in this area are preventing action. It is excellent for balancing the functions of the second and third chakras. Orange is an equal mix of red and yellow, and this combines energizing and focusing qualities. It is associated with the second chakra, which deals with the flow or lack of flow within the body Creativity and artistic skills are an expression of this flow, while shock, trauma and blocks indicate the lack of flow. CARNELIAN is the most popular orange stone, characterized by a sense of warmth and a gently energizing effect. It is commonly found on beaches. It will nearly always be of benefit in healing. ORANGE CALCITE is smooth and lustrous. It is ideal for the delicate encouragement of potential, and because of its softness and watery feel, is good at melting away problems. DARK CITRINE, orange and browny-orange, is a balanced stimulator that will bring out practical creative skills. It can be used as a gentle grounding and supporting stone. TOPAZ, with its elongated crystal form and parallel striations running its length, is an excellent clearing stone that can be used to direct energy around the body. COPPER, which can be found as natural nuggets and crystallized forms, is ideal for use when a lack of flow creates stagnation and clumsiness. It has a beneficial effect on many physical and subtle systems. Yellow relates to the solar plexus chakra that regulates the functioning of the nervous system, digestive and immune systems and the ability to discriminate and identify things. Stress, fear, happiness a contentment are all linked to this colour. AMBER, a fossil tree resin, varies in colour from a lemon yellow to a rich orange brown, including a deep red and green. It has a beneficial effect on the nervous system and self-healing processes. RUTILATED QUARTZ CRYSTAL is a clear or smoky crystal containing fine threads of golden or orange rutile crystals. It is excellent for moving healing energy from place to place, and works well with broken or damaged tissues. CITRINE QUARTZ CRYSTAL is a popular yellow stone. When it is a bright, clear yellow it will help to keep the mind clear and focused. IRON PYRITES, known as “fool’s gold”, helps to cleanse and strengthen. It calms the digestive system. Green is found in the middle of the spectrum and it is associated with the heart chakra, located at the midpoint of that system. Emotions and relationships are balanced here and the qualities needed for growth and personal space are encouraged. GREEN AVENTURINE is an excellent heart balancer. It is gently expansive, allowing for an easy expression of feelings. MALACHITE will dig out deep feelings, hurts and resentments and will break unwanted ties and patterns of behavior. BLOODSTONE is a green quartz with flecks of red jasper, giving it an active balance of energy and calm. It stimulates emotional growth and is of benefit to the heart and circulation. MOSS AGATE is ideal for supporting the lungs and easing breathing difficulties, as well as feelings of being emotionally stifled. It brings in the energy of the natural world. PERIDOT is a vivid light green stone associated with volcanic activity. It is one of the best cleansers of the subtle bodies and will help to motivate growth and necessary change. AMAZONITE calms and balances the emotions and helps throat and lung problems. EMERALD, the green variety of the mineral beryl, is a help to finding personal direction in activity. It brings clarity and calm to the heart and emotions. The throat chakra, associated with communication, works with this color. Communication using sight, voice, color, taste, smell — all the senses — is involved at this centre, as are inner forms of communication the way you talk to yourself, your thoughts and the ability to express yourself all come under the vibration of light blue. TURQUOISE has been used for centuries as a supportive and protective stone. It strengthens all the subtle bodies and the fine communication systems of the body, such as the meridians. BLUE LACE AGATE is a beautiful, banded variety of quartz that gently cools and calms. It can be used for lightening thought and works well with rose quartz. CELESTITE is a soft stone that forms clear, delicate blue crystals Very inspiring and “dreamy” in its qualities, it is ideal for lifting heavy moods and helps with difficulties in expressing spiritual thoughts and needs. It is also helpful for throat problems. AQUAMARINE a blue variety of beryl, stimulates the healing properties of the body. It improves confidence and the ability to stand your ground, and helps to release the flow of communication. The brow chakra, the "third eye", is linked to the midnight blue of indigo. Perception, understanding and intuition are qualities of this chakra, together with a deep sense of peace and connection. LAPIS LAZULI is a rock of different minerals that has a large proportion of deep blue lazurite as well as often being flecked with iron pyrites. It has a powerful effect, stimulating the rapid release of stresses to enable a greater peace to be experienced Lapis also stimulates the higher faculties of the mind and understanding. SODALITE can look very similar to lapis lazuli, though it is usually of a less vivid blue and has cloudy veils of white running through it. It calms the mind and allows new information to be received. KYANITE forms translucent thin blades of crystal that often look like fans. A wonderful mover of energy that is blocked or inflamed, it is calming and clearing and is a rapid restorer of equilibrium to all areas. AZURITE is most commonly seen as small round nodules but can also forms shiny crystals. It will free up difficult and long_standing blocks in communication and will reveal those structures that are stopping us from using our full potential. It stimulates memory and recall. SAPPHIRE can be expensive when it possesses the correct depth of color, othewise you can find good—sized crystals at a reasonable cost. It relaxes and improves the mind. It balances all aspects of the self by releasing tension and promoting peace of mind. Violet and purple are linked to the Crown chakra located above the top of the head. Inspiration, imagination empathy and the sense of service to others are the energies of this centre. Violet and purple stones help to re_balance extremes within the systems of the body, so they can be of use when you are not sure of the nature of a problem. IOLITE is also called water sapphire, but is no relation. It has a subtle violet translucence that increases the imagination and all aspects of intuitive creativity. AMETHYST is perhaps the most useful all_purpose healing crystal. It is universally applicable in its uses and benefits. Amethyst is a good stone to use with meditation as it quietens the mind and allows finer perceptions to become clear. FLUORITE comes in a wide variety of colors, though violet is one of the commonest. It can be used to great effect with the upper chakras where it enables subtle energies to integrate better with normal consciousness, increasing the practical use of ideas and inspirations. Fluorite helps with co-ordination, both physical and mental. SUGILITE is a stone with various shades of purple. It can be useful in group situations where it helps to resolve personal difficulties and brings greater group coherence. This stone is also indicated for those who are uncomfortable with their circumstances or who feel as though they don’t “fit in”. White or clear stones are often used at the crown chakra where they reflect the qualities of universality and clarity of that centre. White light contains within it all other colors, so it symbolizes the potential to reflect all energies. White stones also reflect the energies around them. White is related to the concepts of clarity, cleansing and purification. CLEAR QUARTZ strengthens and brings coherent energy, as does milky quartz, which has a gentler effect. All the subtle systems of the body are enhanced and clarified. A state of harmony is brought about. HERKIMER DIAMOND is a clear, bright variety of quartz excellent for all detoxification processes and for cleansing imbalances from the subtle bodies. It will amplify the qualities of the stones placed near to it. Clarity of mind and vivid recall of dream states are commonly induced. ICELAND SPA is a variety of clear calcite that helps us to relate to the world in a balanced and productive way, with clarity. MOONSTONE is white, milky, creamy or pearly in color. It has a characteristic soft luminescence from which it gets its name. It is an excellent stone for clearing tensions gently from the emotions and from the abdomen, where it can help the digestive system. Moonstone will work well wherever there is imbalance in the fluid systems of the body. SELENITE, also named for its soft moonlight quality, is a type of gypsum. Do not place this stone in damp or wet — the thin slices of crystal will slide apart and disintegrate. Selenite is a good stone for removing emotional turmoil or confusion. It clarifies awareness and helps to reach new states of consciousness. While white stones reflect and clarify light, black stones absorb light. White will reflect the visible, black will show you the hidden potential of any situation. Black is solidifying and manifesting. It holds all energies quietly within itself and so requires patience to explore fully Black stones are usually grounding, acting as energy anchors to help you return to a normal functioning state. Many will also reveal hidden aspects so that they can be dealt with — in this respect black stones have a purifying role. SMOKY QUARTZ is a gentle grounding stone. It is protective and is able to dissolve negative states. It will reach to deep levels of the self to cleanse and balance, and so can be a useful meditation stone. Smoky quartz has all the qualities of clear quartz expressed in a steadier gentler manner. TOURMALINE comes in all colors but the black variety is called "schorl". It is a good protective stone, grounds energies with great speed, and will help to realign physical problems to do with the skeleton and muscles. As a long thin crystal with parallel striations, schorl is a very good energy shifter. OBSIDIAN is volcanic glass. It can be pure black or have flecks white (snowflake obsidian), patches red (mahogany obsidian) or a smoky translucence (Apache tears). Obsidian is excellent at bringing imbalance to the surface so that other stones can clear it away It can also be used to find the hidden factors around situations so that the right action can be taken. HAEMATITE is an iron ore that can be rust red but is more often a silvery grey with a metallic sheen. It will help the assimilation of iron within the body and has a supportive, grounding and centering effect. It is quietening and calming to the mind. There are many gemstones and minerals in which a mix of colors occurs naturally. You can determine their actions from the color combinations that they display. In general, stones that display a full spectrum of color, or that contain rainbow fractures, will be able to reflect a wide range of states and qualities and can therefore be used for a variety of reasons. Stones with a combination of two colors have specific functions determined by those colors. AMETRINE is a quartz which shares the colors and qualities of amethyst and citrine, being part violet and part golden. It balances the mind, augmenting the imagination and the rational mind. OPAL is perhaps the best known of the multicolored stones. With a high water content which refracts light in a multitude of ways, opal works with the emotional balance. Depending on the play of colour, the opal will naturally harmonize with different chakras. AZURITE_MALHTTE is a mix of these two related minerals. It allows the deepest imbalances to surface and then be removed. It will also help you to express your needs in a clear, direct way. LABRADORITE appears a dull waxy grey until it catches the light when beautiful iridescent sheets of peacock blues, yellows and oranges appear. Labradorite will deflect any unwanted energies from the aura. HAWK’S EYE is a blue variety of tiger’s eye with gold, green and orange between deep blue strands. It is ideal for the throat, brow and crown chakras, where its rapid energy enhances the flow of information into the body.